Dominating the 2011 Formula 1 world championship scene, Germany's Sebastian Vettel bested the finest drivers in the world overall for this season. The Japanese Grand Prix at Suzuka was the location where the talented Red Bull Racing superstar scored a convincing second-straight Formula 1 racing crown after 15 of the series 19-race 2011 tour. "I never imagined I would win one Championship and so to win this second one is amazing. I have a lot of good memories from Formula One, from watching it when I was young, to now and I feel fortunate and blessed to experience today." 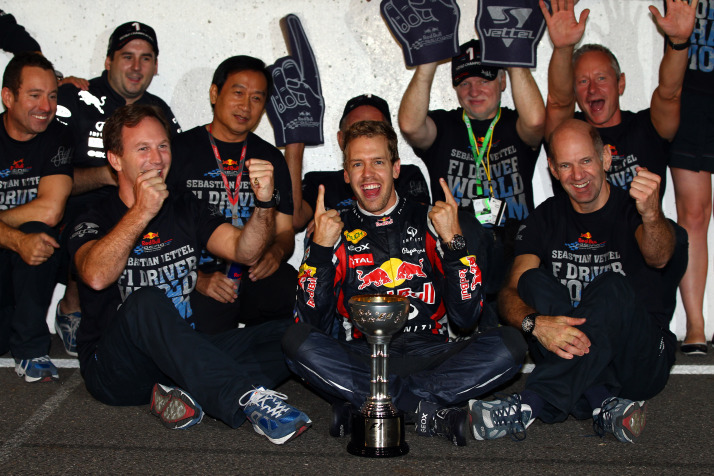 Said the new 2011 Formula 1 champion Sebastian Vettel celebrating his triumphs with the whole Red Bull Racing team. Since his debut at the 2007 United States Grand Prix at the Indianapolis Motor Speedway, the beginning to what is guaranteed to be a long motorsport legend story was established. When BMW-Sauber regular driver Robert Kubica was injured after a Canadian Grand Prix crash, the race turned to a then little-known 19-year old German Formula Renault 3.5 driver to substitute. Sebastian Vettel was the young talent who qualified 7th and finished 8th gaining a single championship point his first grand prix start. Breaking a record in the first grand prix he raced, Vettel became the youngest Formula 1 pilot to score a Formula 1 point. Like the saying goes, "a star was born". An eager, young driver having given the Formula 1 season a sample of his potential, Sebastian Vettel joined the Scuderia Toro Rosso team at the end of 2007. During a first full season in Formula 1 for a race team regarded mainly as a grand prix field filler, Vettel and the his Ferrari-powered Toro Rosso scored points in 9 of the 18 races on the 2008 schedule. Among the biggest point scoring races for Sebastian Vettel was the Italian Grand Prix at Monza. A wet race weekend with rain pelting the Italian circuit, Vettel sailed to pole and then to his first Formula 1 victory. The Toro Rosso team owner Dietrich Mateschitz decided the German was ready for a seat in Red Bull Racing (a team Mateschitz also owns). Making himself at home with the Red Bull Racing team, Vettel took his second career victory from pole at the Chinese Grand Prix. As of the 2011 Japanese Grand Prix, the German has claimed wins from 14 times from pole position. By the end of 2009 season, the Red Bull-Renaults driven by Sebastian Vettel and Mark Webber have begun to assert itself as a meaningful Formula 1 tour de force. In 2010, while much of the Formula 1 season favoured the team's more experienced driver Mark Webber, Vettel launched a late year push involving 3 poles and victories in the final 4 grand prix races. In what was the one of the tightest Formula 1 championship fights, Vettel prevailed by 4 points over Fernando Alonso. Returning as the reigning Formula 1 World Champion, Sebastian Vettel arrived like a steamroller to the competition. Winning 5 of the first 6 grand prix events, Vettel and the his #1 Red Bull-Renault claimed 143 of the series 150 available championship points in 2011. Even as technical rules are brought into the series pointed at slowing the torrent run of the Red Bull-Renault, Vettel kept has momentum storming to a potential to clinch his second straight Formula 1 championship during the 6th to last race. 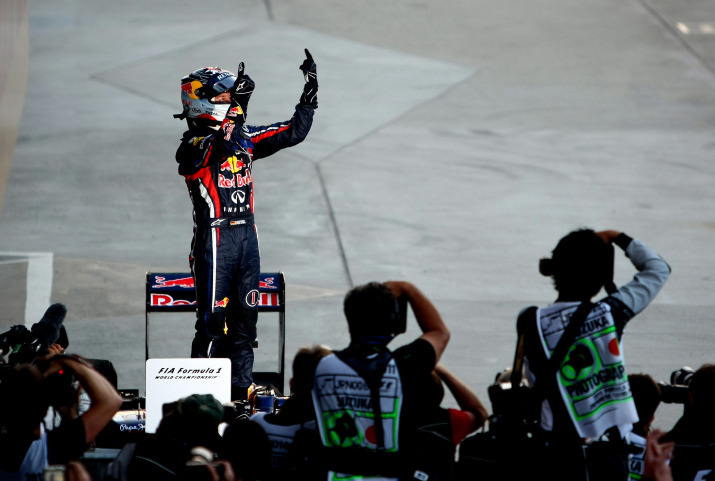 Winning that race (the Grand Prix of Singapore), Vettel fell just one point short of taking the 2011 World Driver's Championship. Needing only to finish 10th or better to clinch the 2011 Formula 1 championship, Sebastian Vettel stormed to pole position through an unusual qualifying session at Suzuka. Attempting to strike for a 10th win for 2011, Vettel settled for a podium after being outrun by Jenson Button's McLaren and the Ferrari of Fernando Alonso. The 3rd place finish granted the Red Bull Racing driver his second driver's title in only his 4th full season in Formula 1. Vettel remained strong enough to secure podium runs in all but 1 of the grand prix races after Japan. In a rarely seen feat, Sebastian Vettel went on to finish no worse than 4th place in the 2011 Formula 1 season's first 15 races. "The first title will always be something special, always deep in your memory. This year has been a completely different year, whereas last year we allowed a lot of mistakes to happen, this year, even if sometimes let’s say the boat started shaking a bit, we kept it on course, we didn't allow those mistakes to really affect us." said the newly-crowned two-time champion Sebastian Vettel through a post race press conference in Japan. When asked about overtaking 7-time Formula 1 World Champion and fellow German Michael Schumacher, Vettel demonstrates a remarkable amount of poise and maturity as a 24-year old driver. "I think speaking of Michael, you always need to back off a little bit because it is something very, very special, what he has achieved. So it’s hard to aim for that, but really I think the secret this year for me has been to go step by step, and that’s what we have to focus on in the future as well." said Vettel. With 4 races remaining, Sebastian Vettel is still within reach of tying another milestone. If the German wins all of the final races in his Red Bull-Renault will collect 13 grand prixSchumacher's 2004 record. Vettel is currently tied for 3rd with his total 9 victories. A certified Formula 1 superstar, Sebastian Vettel's passion erupted on Sunday declaring his feelings after the Japanese Grand Prix was, "I think that’s what life is about! ".